Hello again! It has been far too long since I have reached out to the world. Adjusting to my mostly nocturnal lifestyle has been rough, and I have, for the most part, been a pretty good hermit. Work goes well. It is nice to have a reasonably steady income again. 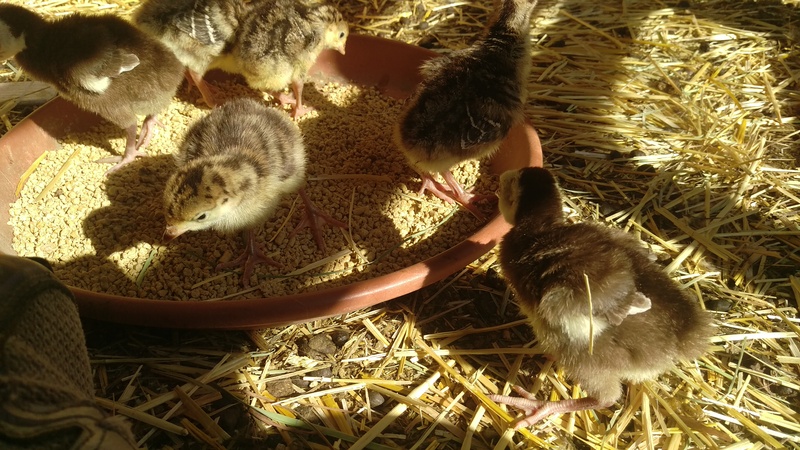 The ducklings were successfully raised by their respective mothers and have been freezer-trained, along with 22 Cornish cross chicks. It is nice to have home-grown meat in the freezer and pantry again. I have spent quite a bit of time getting comfortable with my pressure canner, so there is an assortment of tasty meals ready when I’m hungry & don’t feel like cooking at the moment. I was able to travel up to Friend’s Thanksgiving with Daughter’s friends this year. I feel very blessed to be included in the festivities. Kid the Younger successfully applied to join German to his master’s degree program. The process included an interview in German. His grades for the 1st part of the year were a B and 2 A’s. I am one proud mama! Kid the Elder and his wife are looking at moving to a warmer climate in the next couple of months. We all hope it will be a positive move for them. Mom came through her knee replacement like a trooper. She worked really hard at her PT and has come out stronger and with better range of motion than before. It was hard at first, since I was working full-time, running the farm and taking care of her. I ran on very little sleep for a couple of weeks, but we all survived. 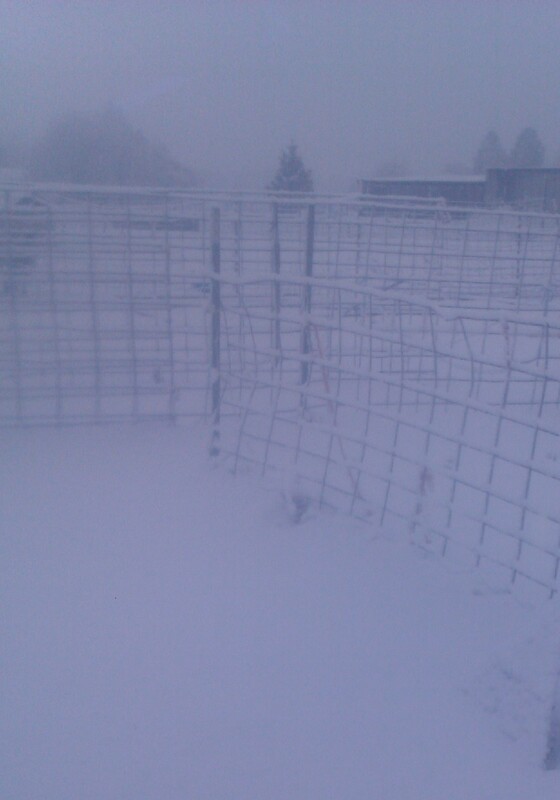 I made a decision not to breed the sheep or goats this fall. Originally my plan was to see how long I could keep milking the goats, but taking care of Mom after her surgery kind of interfered with that plan. The last few months have presented some challenges as well. The pump that brings water into the house decided to die. I had been unhappy with the results of having it rebuilt by one of the big pump companies in town a few years ago since it had continued to leak despite several call-backs. So I chose one of the other companies available, and that seems to have done the trick (fingers crossed!). I was prepared to have to replace the pump, but they encouraged me to rebuild it instead. Had a couple of plumbing leaks that needed professional attention. I had hoped that it was just one under the house, but there was another within the wall between the laundry and bathroom. Since I had to tear the laundry room apart to gain access for the plumber, I am totally redoing the room as I put it slowly back together. I have scrubbed it down and am working on painting the walls & cabinet a soft yellow. I am also getting rid of the food that no longer fits my life style, so when I refill the cupboards they will only contain good foods. We had a major wind storm a couple of weeks back, and I came home to find the roof of the front porch had partially collapsed. I had to take about 2/3’s of it off to be able to get in the front door, breaking a kitchen window in the process. I also managed to tweak my back and left shoulder, but they are settling back down. The broken window has been boarded up and will be replaced when the weather is a bit better. My car will be needing an emergency trip to the mechanic next week. I went out to let it warm up before heading to work Monday night and it wouldn’t start. Luckily, Mom was able to come get me and has lent me her car for the next few days. I was hoping it was just an old battery giving out on me, but it appears to be more than that. I know that it has needed a major tune-up for some time but other things keep coming up (see above). Hoping it isn’t too bad. I’m probably forgetting a few things, but we’ll talk again soon I hope. 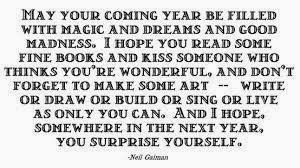 Here’s hoping that 2015 brings only good things to all of us. Much peace and happiness to all of you! Yes, finally, after many applications and way too few interviews I have a job again! I am currently in training to be a monitor for a security company. One of my friends works there and recommended me to them. Eventually I will be transitioning to the midnight to 8 am shift, which will work much better for this night owl. Getting up at 6 to be to work by 8 am is very hard for me. I feel chronically exhausted even though I am actually getting more sleep than normal. Funny how our internal clocks run differently. It hasn’t helped that I am also coming down with something (all those wonderful new germs I’m being exposed to). I am very glad that the weekend is here, and hope to sleep my sickness away before Monday morning. The biggest change when I move to the graveyard shift will be that I will change the time I feed the beasties from the late afternoon to the morning when I get home, after I milk. I will lock the babies away from their mom’s before I go to work (now I do it before I go to bed). It will be nice to have some income again, even if right now I feel like my head may implode from all the new information. The animals are all doing well. I think I have finally blocked the crossbred ducks from escaping. Not only had I been worrying about their safety, but almost a week went by with the 2 brown females successfully hiding their eggs from me. The blue female apparently hadn’t been watching when they were getting out, because she was always in the pen. After I locked the pen down I found a nest under my lilac bush with 6 eggs in it. The next morning, one of the browns was very vocal while I was milking, and as soon as I went in the pen to collect eggs she dashed out the open gate. I let her go while I collected the 2 eggs from her pen and checked the chickens (who consider 7 am too early to be getting down to business). But when I looked under the lilac, the nest there was empty. It took me a while to figure out where she had disappeared to (across the alley way, under an aspen tree). As soon as I spotted her, she ran back to the pen, leaving behind a nest with 7 eggs! Mystery of the missing eggs solved! The weather has been cool enough that I was not worried about using the eggs (but it has been too cold at night for the eggs to be viable). 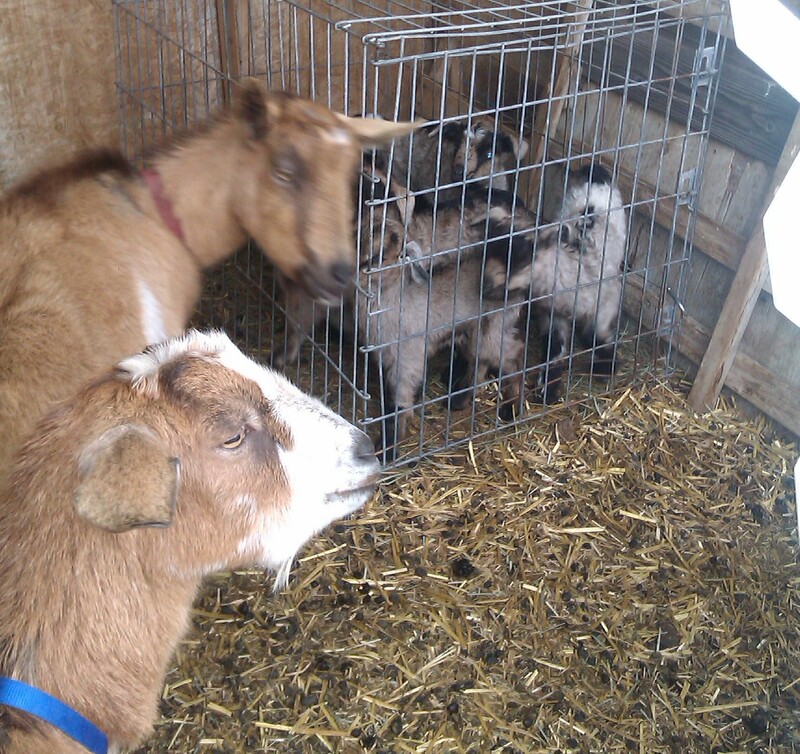 Unfortunately, I have not been nearly as successful at containing the goat kids. They are all still little enough to squeeze easily through the fence, and short of applying a layer of finer mesh fencing all the way around the pen my only hope is for them to grow quickly. They are enjoying the access to fresh grass that is denied their mothers (though I do let the does graze for a while after milking while I do other chores). They are cute little buggers, to be sure, and I am a source of great amusement when I sit on the ground in their pen. And they are learning to head to the barn when I go out after dark to put them to bed. They have half the barn to use now instead of just the crate, with some fresh hay that they don’t have to share with the big girls (who are all convinced that this is totally unfair). I have been playing with all the milk, making more cajeta, yogurt and pudding. I am also putting the finishing touches on not one but two cheese presses, so hopefully I will feel better by Sunday so that I can make a couple of wheels of cheddar. They will not be huge, but that will actually work better for what I want. Definitely an improvement on my improvised set up the first time around. I’m down to the last little nub of that effort, and it has aged wonderfully so I am looking forward to making more. I know that the cheese will be a bit different since I will be using my own milk rather than cow’s milk, but I am hopefully that I can be successful with my efforts. I’m going to leave you with this poster I found somewhere online (I’d provide the link but my brain is too full of new info to remember where I found this). It seems to me lately that the disconnect from the realities of what we use is becoming more prominent in our society. It’s not just about people not understanding where their food comes from, though that is huge (I think we’ve all seen the letter to the editor about how hunters should stop hunting and get their meat at the grocery store, where no animals were hurt). 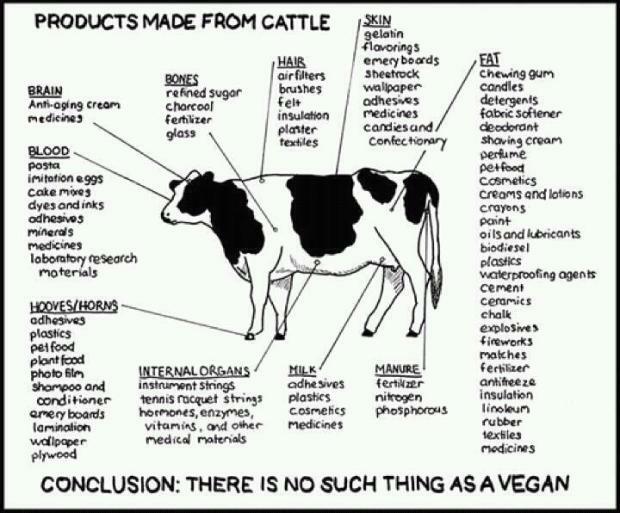 Personally, I’m glad that so much of a slaughtered animal gets used. Better than throwing things away! 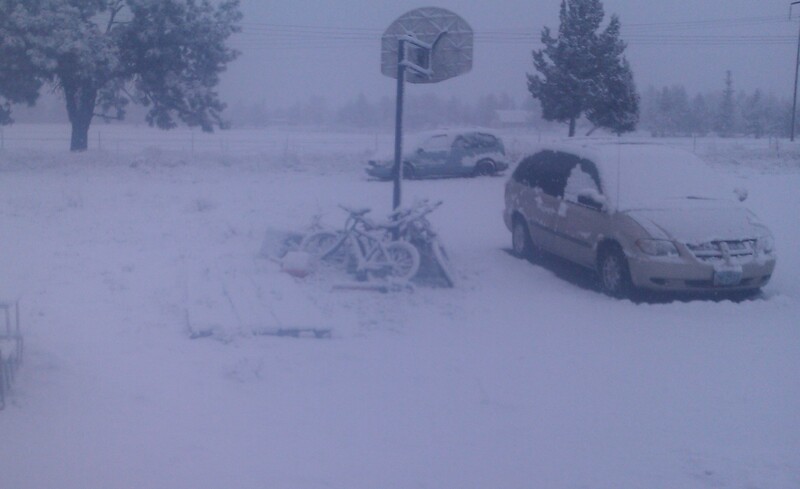 Mother Nature obviously has a weird sense of humor, because this is what I woke up to this morning. I am not impressed! At least I’m not milking in the same set up as last year, which looked like this. I used to have Myrtle tied in the corner there, with the fence to her side so she couldn’t get too far away. My new set up may not be perfect, but at least there is cover over my head, and I am shielded from the worst of the wind and weather. I’m using my fitting stand. I need to make a better head gate, but it works. The grain pan hangs on the wall to the left (in front of the goat), and there is a bench at the side for me to sit on. I milk into a pint measuring cup and take a mason jar to carry milk back in with. That way I can keep pretty exact records on how much each doe gives me. 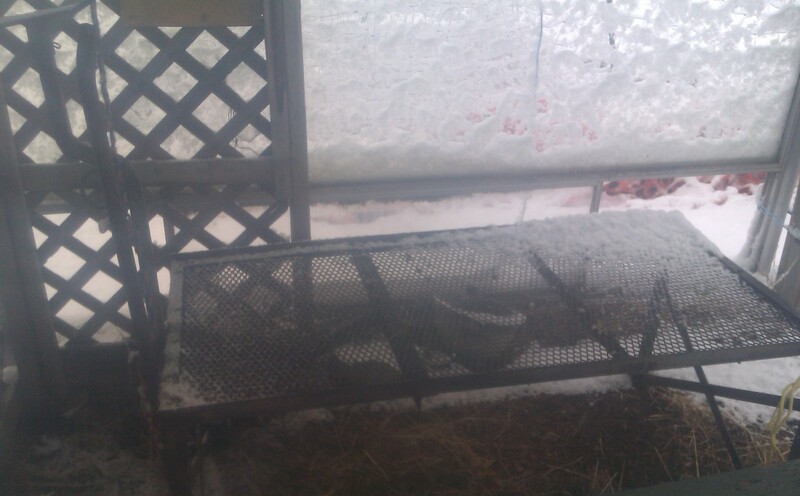 I know the pictures aren’t great, but there hasn’t been a lot of ambient light today, as it has been snowing all day. I am so done with winter! We are settling into a routine. I lock the kids up before I go to bed, at about midnite. For now we are using an old dog crate that used to belong to one of my Akitas. The kids will outgrow it soon and I will have to make other arrangements, but this allows them all to see their mommies at night without interfering with my ability to milk said mommies in the morning. At about 8:30 am, I go out and bring all 3 does out of the pen on leads. Two get tethered on to t-posts while I milk the third. The order is Myrtle, then Cloe and finally Clara. Once everyone has been milked, they get to graze while I do the rest of my morning chores (though the snow this morning meant access to hay, not fresh grass). The rest of the chores consist of locking Bridget in the barn for some supplemental feed (she is looking her age right now and needs the extra), and collecting eggs. Once those are done it’s time to take the does back to feed their children. I wish I could adequately capture this on film. The general consensus seems to be that any mom will do, and Cloe and Clara are ok with that. The other morning, poor Clara had all 7 kids clustered under her before they split off for the correct udders. I am putting Myrtle’s milk into a bottle which I offer to her kids first thing in the morning and last thing at night. 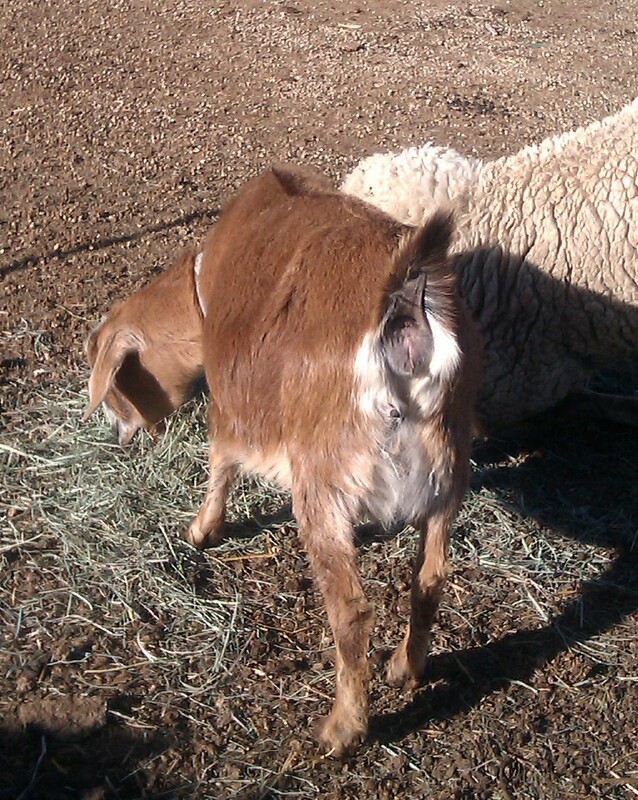 The triplets are bottomless pits, but hopefully that will taper off a little now that they are eating some hay. Even when their bellies are full they want to keep sucking on the bottle, but I make sure they all get a turn. Since I’m only supplementing, I don’t want to carry more than one bottle out, and I want them to nurse mostly on their mom so they are only getting the 16-20 ounces I’m getting from her in the morning. They sure are cute little buggers though. Obi Wan and Odin are both naturally polled (like their mother, it turns out), but all the others are getting pointy bits. 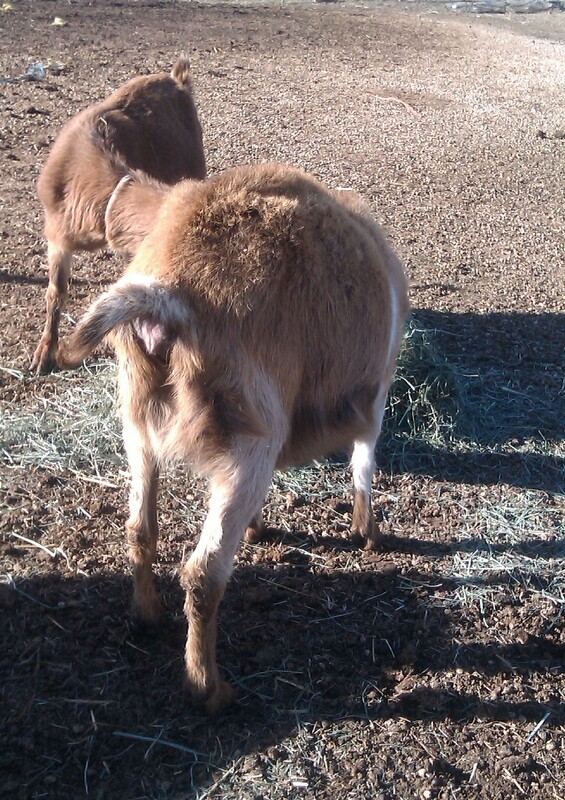 I don’t mind horns, and since none of them will be joining the herd on a permanent basis I won’t bother debudding them. So, how is production you might ask. Well, I started milking Myrtle on March 16, Clara on the 21st, and Cloe on the 22nd. Since then, I have gotten over 3 1/2 gallons of milk, milking just in the morning. We’re all learning together. Myrtle’s milk is getting put in the bottle for her kids, as I said earlier, and I’m playing with the rest. I tried my hand at Cajeta the other day (goat milk caramel sauce. Think Dulce de Leche made from goat milk). I need to work on my technique, but it has great potential to be highly addictive stirred in to my coffee. And while the chickens are not reacting well to having ducks sharing their quarters and have quit laying, the ducks are all starting to lay. Since the 16th, I’ve collected 44 eggs, not bad considering I only have 4 hens. Mom has declared that these are the most delicious eggs I’ve ever given her, and I may have to agree. The yolks are so dense and yummy! I want to make fresh pasta soon, as I hear that duck eggs are the best for that. Last Saturday was our annual Fiber Market Day at the Prineville fairgrounds. I shared a booth, which kept expenses down, and spent the night before at Laura’s house to save gas. This is the first time we could set up the night before, which was a great improvement. In the past we have had to start setting up at 7 am and be ready when the doors open at 9! The weather cooperated, and we had a steady flow of customers most of the day. I did a demo on spinning with a drop spindle and hope to have made a few new addicts. I brought a basket full of cd spindles for the adventurous to try with, and even let someone try out my Golding so that she could see the difference a good spindle makes. It was a good thing that I made a little money, because I had to replace a tire this afternoon. That was not what I had planned for that money, but at least I had it available. Fingers crossed for more regular income soon! Doing without is getting old. And that quickly, kidding season is over. Wow, that was fast! 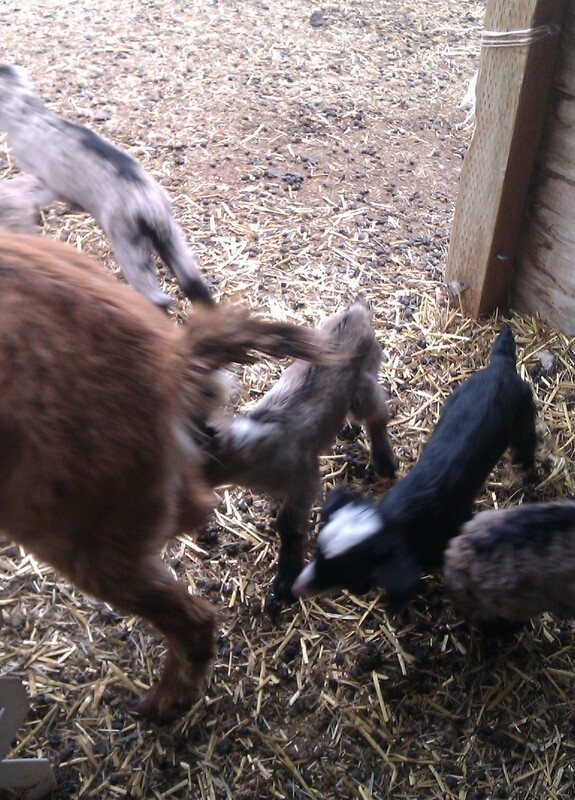 In a week, my goat herd has more than tripled. 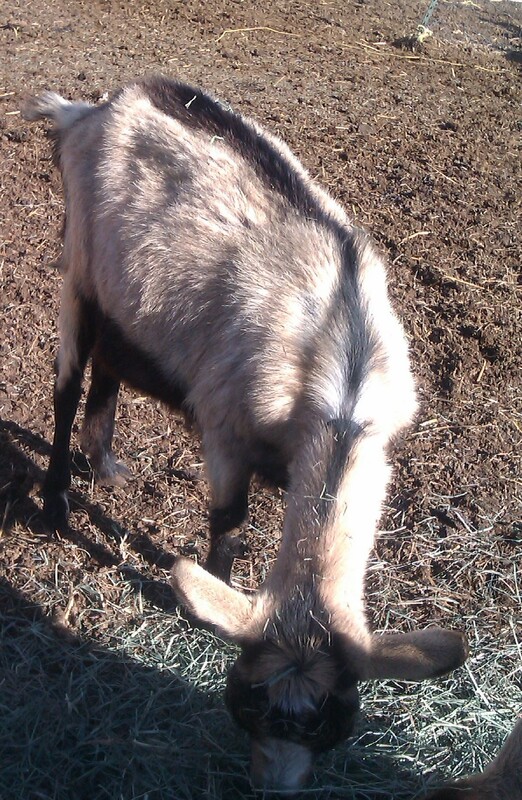 I’ve gone from 3 very pregnant does to 10 goats! I had told the Goat Girls that I had plans on Tuesday (more on that later), so they needed to cooperate. 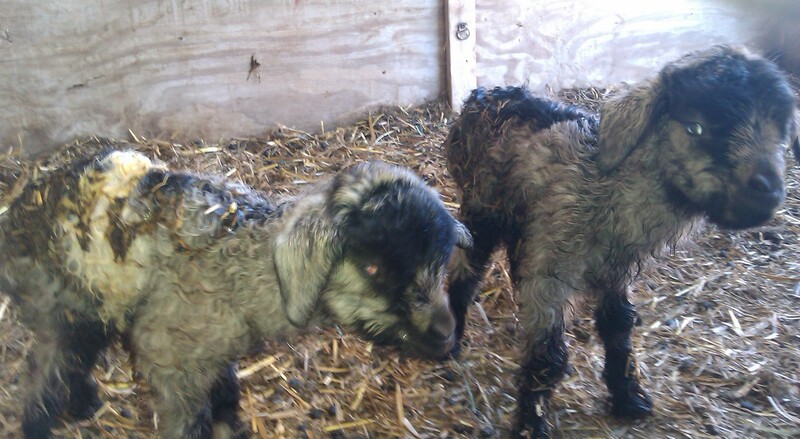 Clara had her twin boys on Monday afternoon. 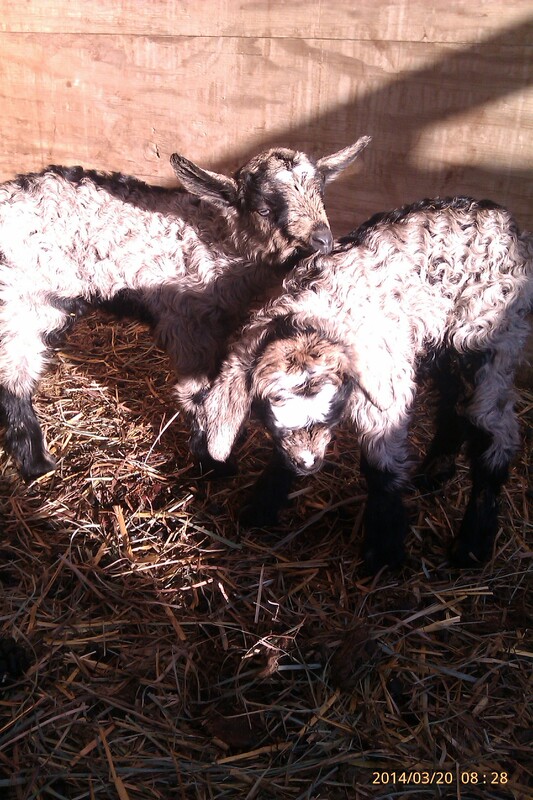 Compared to the triplets, these guys are bruisers! Taller, heavier, even their voices are bigger. It appears that the triplets took after the Nigerian Dwarf side of their mom’s family. The new boys show the Angora influence of their father in their cute curly coats. In honor of their birth date, I picked Irish names for them. Oran is a solid chamoisee, while Odell’s pattern is interrupted by a wide white belt. Yesterday, Cloe cooperated with my plans for the day by being in labor in the morning and quickly (and loudly!) delivering a pair of doelings. They are a nearly perfectly matched pair, the only difference being the amount of white on their foreheads and their ear set (not obvious until they completely dried). Olivia has the more Alpine (upright) ears of her mother, and Omega has the same droop ears as all the boys. Again, I got the curly coat I was hoping for. All the babies are doing great, and this weekend I will be building them a play area so that they can quit pestering the mommies and sheep that are trying to nap in the sunshine. There will be much bouncing. I have been locking the triplets up at night in a big dog crate so that I can milk Myrtle in the morning, and Clara’s boys will be joining them tonite (I’ll give the girls a day or 2 more before they join too). I make sure that everyone nurses well before bed time, and at least for the time being I am putting Myrtle’s milk into a bottle that gets shared by the triplets during the day. Especially first thing in the morning it’s hard for them all to get breakfast at once, but I am not interested in taking over entirely. Othello is the best at attacking the bottle, but his brothers are catching on to the idea too. They are just so stinking cute and tiny it’s hard to get anything else done during the day! The twins are all about twice their size, but their diminutive size does not seem to faze them in the least. So, what were the plans on Tuesday that I didn’t want interrupted? Laura had bought a “new” car on the other side of the mountains and we needed to run over and get it. We also took the opportunity to run by Michelle‘s and give her a quick lesson in tubing a lamb (a wonderful skill that every shepherd/goatherd should have). I also got the chance to meet her wonderful horse, Lance. The original plan had been to take the borrowed car back at the end of our trip but it was getting late, so we put that off until yesterday. Luckily, Cloe cooperated with that too so I was just a little late to meet up with Laura again, and we had a nice visit with the friends that had loaned her their spare car while she vehicle-hunted. We had a grand time swapping stories and socializing Tillie, who is sister to Laura’s Aengus. It was nice to sit in the sun with good friends! And as an added bonus, Laura treated me to lunch at a new-to-us Mexican restaurant, which was recommended by another mutual friend. We will definitely be going back, because it was fantastic. Another catch up post. While I am doing better at posting regularly (3 times in January! ), I need to get better about not letting so much time go by undocumented. More for myself than anyone else. I like looking back and seeing that I have made progress, even if at times it is just baby steps. I think a lot about posting, but then let inertia take over. First, I want to report on two books that you might want to look into. My friend Leigh published a book about setting up her homestead. I love her blog; I appreciate that she doesn’t hide the failures that we all encounter as we work towards self-sufficiency. The other one is by my friend Rachael. Pack Up The Moon is her latest book. A fellow NaNo participant (and knitter), Rachael took the plunge a few years ago and has become a Real Author. Now, I am not a girly-girl and don’t normally watch chick flicks or read romance novels, but Rachael’s books are different, and I highly recommend them. I want to meet her characters for coffee and some knitting time, if you know what I mean. You can’t go wrong with either of these books (or both!). I’ve been reading a lot of new-to-me blogs lately. When I find someone who’s writing I like, I go back to the beginning of their blog and binge-read my way to the present. It sometimes takes a while to get near enough to the present to be able to comment, but I like looking at their whole journey. It is frustrating that many of the ones that really touch me seem to cut back on the amount of time they spend blogging (a few are now taking longer than even me to post new stuff!). I have found some wonderful new recipes to play with, and a few new patterns to try when I get bored. It has been a challenging winter. If I were not by nature an optimist, I’m not sure that I would still be breathing, and there have been moments when even doing that have seemed almost too much to handle. Yet even in the darkest minutes, I know that I have much to be grateful for, and I know that life will get better. And so I wait for the darkness to brighten, and trust that it will. There have been some bright moments lately, so I’m hoping they are the beginning of the improvements. Kid the Younger has been accepted to graduate school (Bowling Green State University, in Ohio. That is so far away!). Daughter-In-Law had her SSDI hearing (fingers crossed for a positive outcome, soon). An Extra Daughter announced her engagement, which means I need to get started on a wedding shawl for her. My lambing season was a total bust. Midge presented me with a darling horned son, who unfortunately got smooshed in one of the shelters during one of our nastiest snow storms. 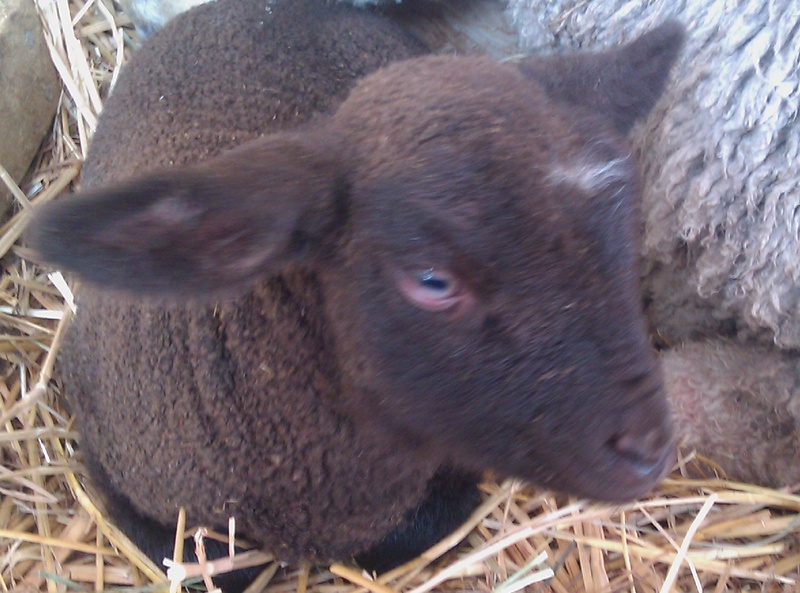 Eartha came down with pregnancy toxemia, and despite my best efforts (and a valiant struggle on her part) I lost both her and the twin ewe lambs she delivered much too early. In all, I have lost 11 animals since October, and each one hurts. But the goat girls are due soon. Udders are filling, and I have felt the kids bumping against their mothers sides. Soon I will be drowning in fresh milk and kids will be hopping everywhere, and those are good things. I got the new milking area set up last night and tried it out this morning. I moved the picnic table out of the little sheltered area that Sweetie built (he always called it the Pergola) and Kid the Elder helped me move a large window over to serve as a wind break on the mountain side (where most of the wind comes from). It won’t be perfect and may need some more work to shield us from the weather, but I won’t be sitting on the ground in the rain to milk this year. I moved my fitting stand in for the goats to stand on, and I have the picnic bench to sit on. I may work on a better neck gate but I’ve cobbled one together to get us started. This morning I took all girls out on leads (much to the upset of all the sheep in that pen). Two got to graze while I worked with the third. On the stand they got a handful of grain while I brushed them out a bit and handled udders. Cloe is not at all convinced that I should be touching her There, but she is very food oriented so tolerated it. Myrtle and Clara were both pretty blase about the whole thing. I want them all to get into the routine of coming out in the morning before they kid. After the kids are well started I will start locking them away from their mamas at night so that I can milk in the mornings, and think it will be easier on everyone if I start going through the motions now. Today it was just brushing, but tomorrow I will trim a few hooves. No sense wasting the time on the stand. I’ll make a decision about twice a day milking after I wean the babies. It will depend on how much milk I’m getting with once a day, and the job hunt also. I have had a couple of interviews, and hopefully one (or more) of them will materialize into actual job offers. As much as I love being at home, the stress of having no income is overwhelming. I am tired to the core of being told that I am over-qualified, and really want to be able to use my talents for financial gain. And the idea of having a little money to spend on a splurge would be nice too. A hair-cut and a movie would be wonderful! From a very young age, my mother called me frugal. I always hated the word as a child, equating it in my mind with being cheap. I am not cheap! It was only over time that I came to appreciate the label for what it truly is. And mom was right, I am frugal. I spend money on good things but I am not wasteful, and I am a simple, plain woman. I don’t use makeup (except on very special, rare occasions), I don’t fuss over haircuts or clothing, I can count how many pairs of shoes I own on one hand (to Daughter’s great despair). I save things for future use, I use things up, I re-purpose things. I always have, even as a child. It wasn’t behavior that I was taught. My parents were well-to-do, and my dad spent money like there was no tomorrow. No one picked up a dinner tab if he was at the table (I almost had to come to blows with him when I wanted it to be my treat, even if he had agreed before dinner). I saved my allowance for special purchases, hidden between the pages of books in my room that my sister pilfered on a regular basis. Being frugal is very helpful now. While I am sometimes at a loss to figure out how the electric or phone bills will be paid when there is no money coming in, I am resourceful and they do get paid. The house is reasonably warm, and I eat well. The universe provides what I truly need, if not the things that I would like. I am grateful, happy even, living my frugal life. Two things this week make my point very well. Kid the Younger, Fiancée and Roommate came over for the weekend last week. While it meant giving up going to my spinning group and seeing friends, those were easy sacrifices. I pulled a chicken out of the freezer and mom & I planned a feast. Main course covered, she did sides and I cruised the web for a new dessert to try out using what I had on hand. 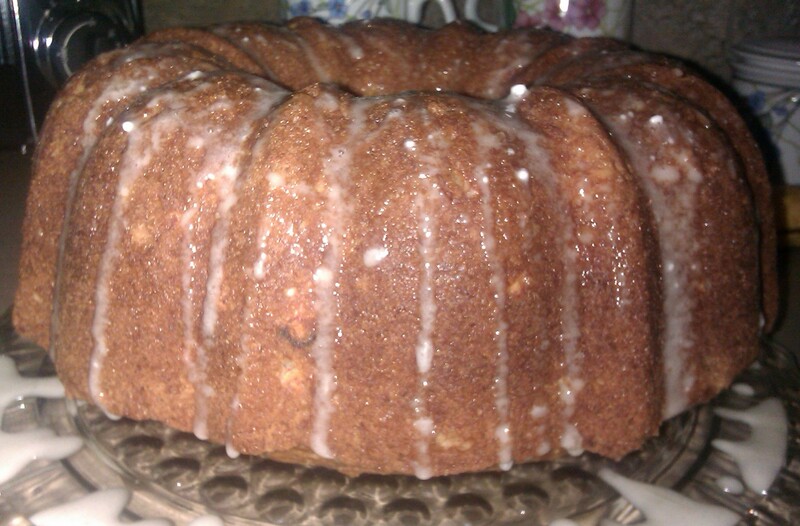 Came up with a Pineapple-Banana Cake which will definitely get more play around here! Pineapple from the pantry, eggs from the chickens, bananas from the freezer. It is not overly sweet, which I really like, and it lasts for days (not that it really had a chance to). The glaze is pineapple juice and powdered sugar. Mom and I discussed some possible modifications to the recipe to change it up a bit. This is the chicken before it went in the oven (forgot to take an after picture, oops). 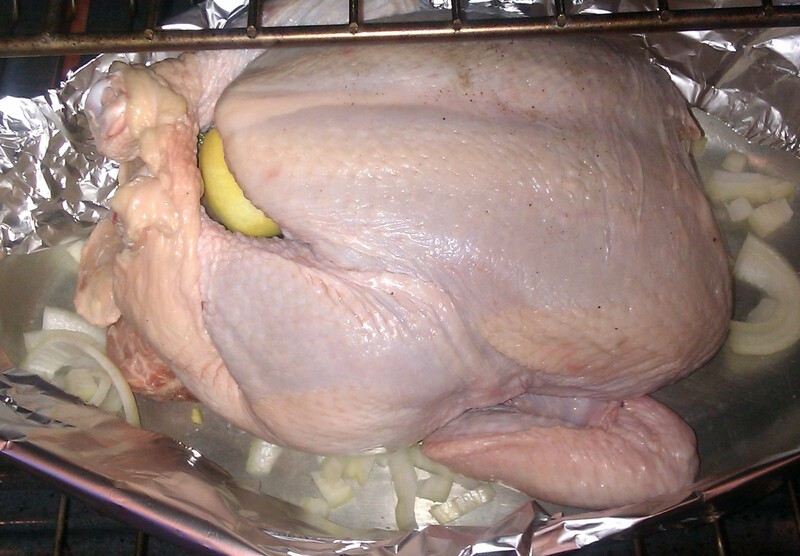 Very simple roast chicken, salt & pepper, fresh rosemary from mom’s garden, a couple of leftover lemons in the cavity. We ate a lot of it that night, and I left several slices for mom. I made several meals off the meat over the next few days, and then the carcass was used to make soup which will feed me for several days also. The pantry supplied all the spices and goodies I need to make a filling soup: a can of chicken meat, one of tomatoes, potatoes from the Free Potato Day, carrots from the fridge, onions. Simple, plain fare, but filling and satisfying. My other example isn’t pretty, at least to start with. 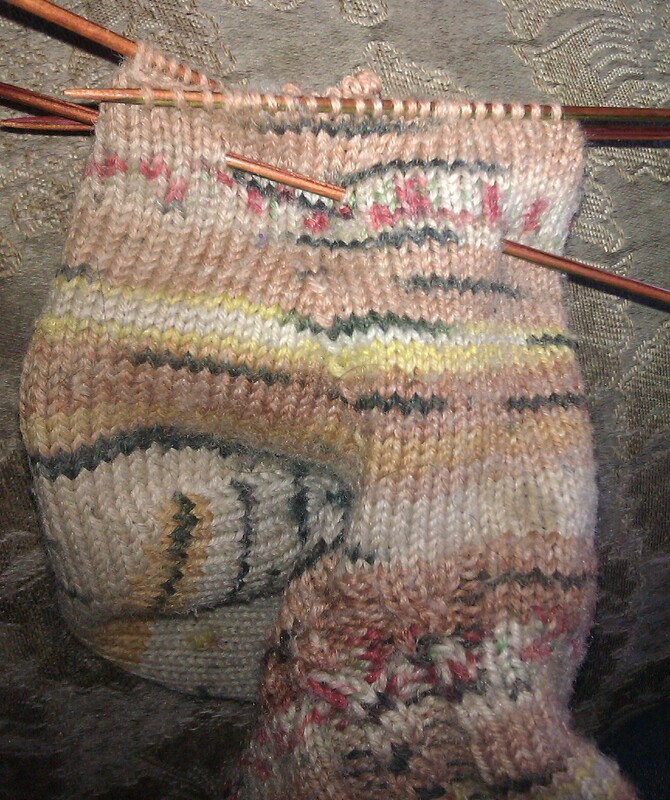 I love my hand-knit socks, but I am not easy on them. I tend to wear just socks on my feet in the house during the cold months. I should use slippers to save wear and tear on them, but I don’t. Sadly, this is the result. I have worn huge holes into the feet of both socks. I don’t know how to darn holes (it’s on my list of things to figure out). Yet the legs and heels of the socks are fine, and I have the leftover yarn (there’s that frugal thing again). 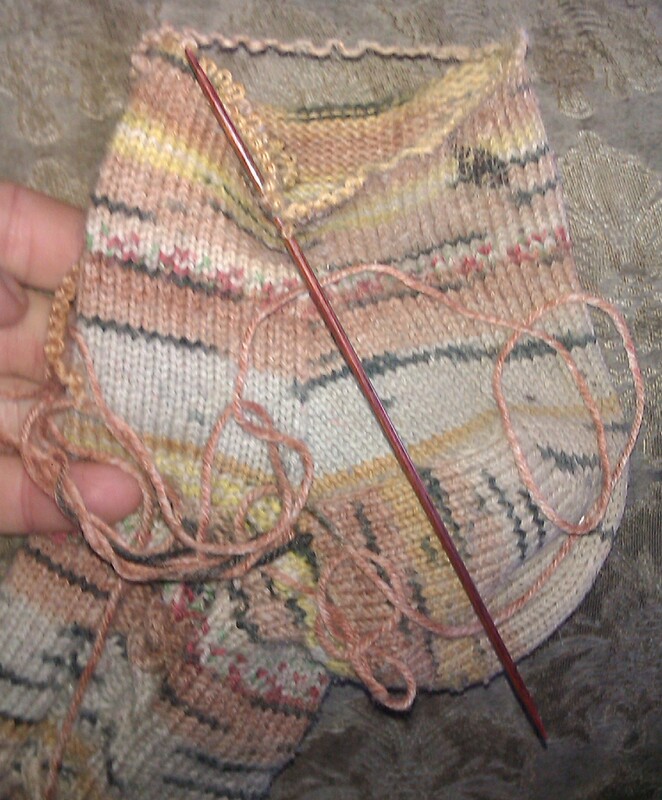 So I cut off the toes of both socks, picked up stitches, and am in the process of reknitting the toes. Faster than knitting the socks all over. I’ll have to weave in a couple of ends (no biggie), and my socks will be useful again. As an added bonus, it has freed my mind from the fear that has been keeping me from completing my vest which has stalled out over the idea of cutting the steek. Yay! Up until today the weather has been lovely. Today, we are a foggy, cold mess. I am thankful that there is little need to be outside today, other than chores this afternoon. No lambs or kids yet, though bellies are swelling. I finally sealed up the hole that Myrtle was getting out through. Fencing is always a challenge with a thinking goat. She’s still looking for a new way to escape, silly girl. The wind is howling outside, throwing frozen rain against the side of the house. Inside after doing chores, I am warmed by the old fence posts I cut this afternoon with the chain saw. The wood pile is long gone, so I am scavenging wood off the farm now. Luckily, there is enough, for now at least. I am resourceful if nothing else. A blustery day is the perfect time to gather the seed catalogs and to start dreaming. I would love to have an abundant garden, but living in the High Desert makes that a challenge in the best of years. Still, I am starting with a good base. Fairy God-daughter gifted all her Fairy Godmothers with an enormous quantity of seeds left over at her work last fall, so there are only a few holes that need to be filled in. And the dreaming is the best part of gardening! No weeding, no hungry insects or loose chickens to prey on the tender plants, no weather to contend with. Just the beautiful pictures of ripe produce, promises of the bounty that could be mine. Even an over-abundance of zucchini isn’t a scary idea at this time of year. Bring on the vine ripened tomatoes, tender carrots and beets smelling of fresh dirt, peas and green beans waiting to be steamed lightly and enjoyed. Luckily, I just put a lamb shoulder roast in the oven to cook with some of the bounty of potatoes from Rainshadow Organic’s generosity and a few carrots, onions and a bit of oven-roasted garlic from the freezer, so all the dreaming will be well fed in an hour or so. I also dream of planting an orchard. I love fruit. Even as a child, during the season I would forego spending my allowance on candy in deference to fresh cherries. I have planted several fruit trees over the years, but gave up when Sweetie kept insisting on using the weed whacker around them (he girdled and killed at least 10 trees). I have one lone sour cherry tree that survived the carnage, having lost apples, peaches, pears, apricots and the sweet cherries. I have never gotten any cherries from it but remain hopeful. 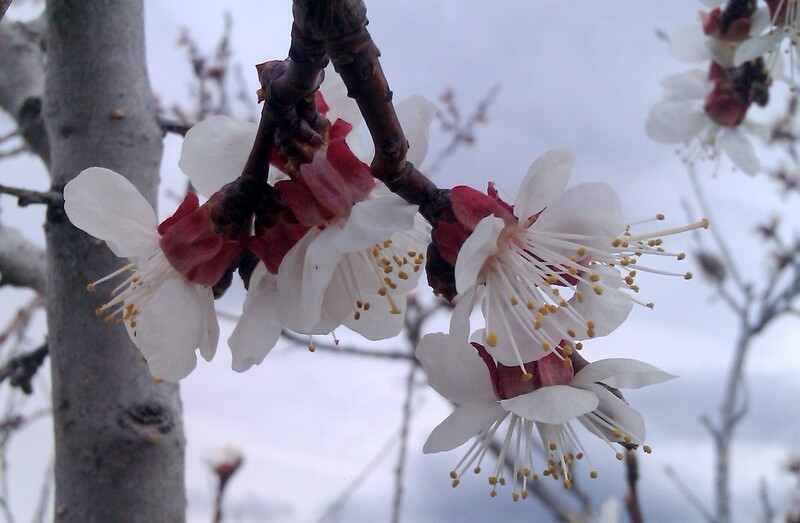 It bloomed well last year, but we had a cold spell immediately afterwards. I keep thinking I should move it to try to find a place where it will be happier but probably I never will. I am going to be more aggressive about pruning it this spring, to get rid of the abundance of dead wood that it has (which is destined for the smoker). I look at blogs of gardeners in warmer climes and envy them their early springs and long summers. In cleaning out the barn (which hadn’t been done in a few years, and has yielded some lovely compost), I have created some new garden beds. I think that they will be devoted to growing squashes this summer. I have 3 kinds of pumpkins to play with, and several other including summer and winter types, plus a couple of ornamental gourds. A girl can dream, right? All the existing beds will be well fertilized as well. I am ready to get my gardening mojo back after a lull of the last few years. 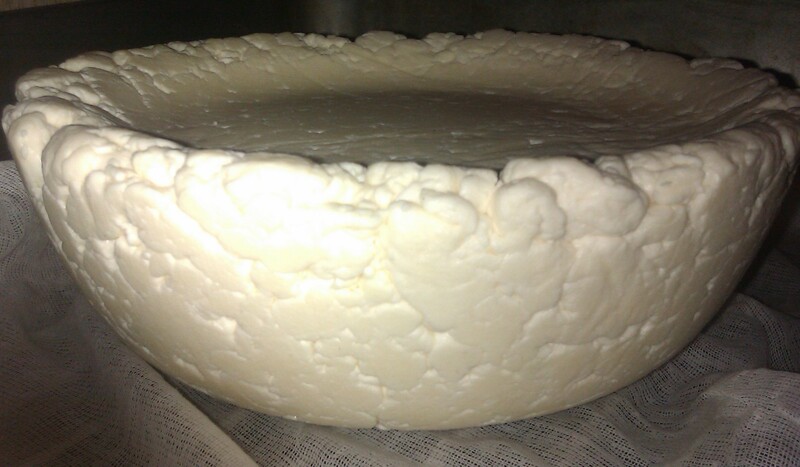 I do need to report a successful foray into the making of hard cheese! It isn’t finished yet, since it needs to age for at least a couple of months, and it won’t win any beauty contests. I jerry-rigged a press using the steamer basket of my Revereware. The sloped sides of the steamer means that my cheese isn’t pretty, and the sides aren’t pressed as well as the middle. A little chunk broke off when I turned it (all right, I helped it escape into my mouth!) and it already tastes like cheddar! I am super excited about the possibilities. The goat girls are all showing signs of definitely being pregnant, so in a few months I will need to step up my cheese-making efforts. Hard cheese is the best way to preserve milk, at least as far as I’m concerned. I have an idea for a better press , but hadn’t solidified my ideas when this one was ready. 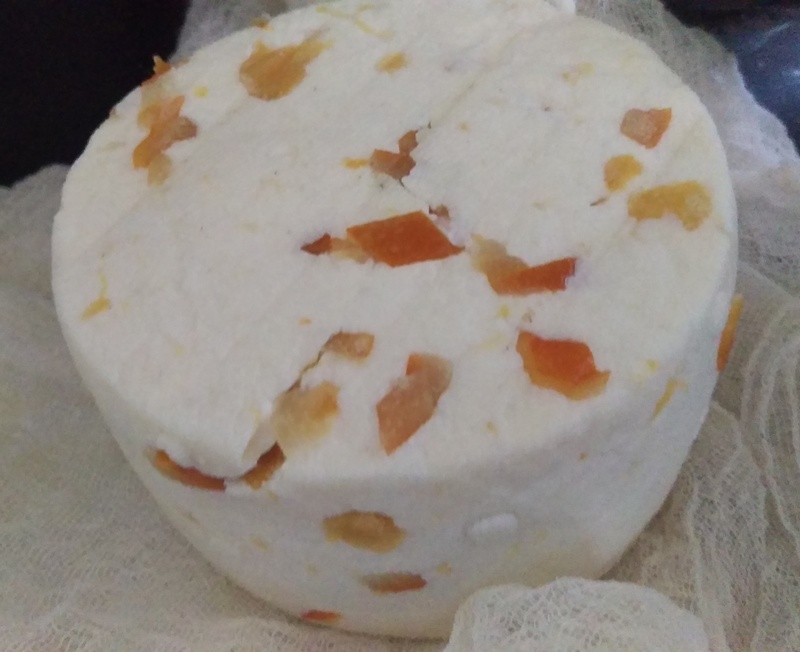 I also made ricotta from the cheddar whey with some very interesting results. It didn’t make nearly as much (12 ounces vs the 1+ pound I got from the mozzarella whey), and the texture is much finer, making a smoother ricotta. I don’t think I’ll notice a difference when it’s cooked, though. I am not sorry to put 2013 in my rear-view mirror. I know that I am up to the challenges that life throws my way, but I am tired of doing it. If I were not such an eternal optimist, I would have curled up in a ball. Not saying I didn’t do that a bit, but for the most part I kept on dealing with reality. So what made 2013 so hard, you might ask. Lack of work was huge (and continues to be, at the moment). It isn’t that I don’t have plenty to keep me busy. I have never understood folks that can’t find things to do to keep themselves amused. And with the animals and property to care for, there is never a shortage of chores that need doing. But with no paying job, that means no money coming in to take care of those things that require something other than physical labor. I am continuing to look, but am getting very tired of hearing that I am over-qualified. I have never understood why an employer would not want to hire the most qualified person they can get for the money they are offering. But my biggest challenge was the one that went on for way too long – no running water. My home runs on a cistern. Just before Thanksgiving, it ran dry. When it refilled a few days later, I could not get the pump to hold a prime and run. Yikes! This coincided with a deep freeze that gave us some of the coldest temperatures the area had experienced in a very long time (down to -30!). I spent several weeks bringing home jugs of water from my Mom’s house, and accessing cistern water for the animals via bucket brigade. That is a workout that I am not eager to repeat, but at least I was up to the work. Just call me Pioneer Woman. Just after the Solstice, a friend’s boyfriend came over and got the pump figured out. Yay! I filled the animals waterers, and went off to celebrate with a soak at the Turkish tub. But of course, that was too easy. When I got home from my soak, we discovered that there was a major leak under the house. So the pump got turned off again, and I went into major denial. I am not afraid of plumbing repairs, mind you, but I had a severe case of the “I don’t wanna’s”. Luckily, my friend offered up her boyfriend again, and a few days later he came back. There was a major break in the metal pipe that ran from the hot water heater to the kitchen sink. He ended up cutting out the old pipe and replacing it. Yes, I could have done it, but it was so nice to be taken care of! The only down side was how much water emptied out of the cistern during the 6 or so hours that the leak went undetected, but time will remedy that. I know that in much of the world having no running water is the norm. In the grand scheme of things, being without was merely an inconvenience. I am lucky that my Mom lives close enough that I could go over to her house to fill up all my jugs and take a hot shower. Being in an old mobile, I long ago developed the habit of entering winter with at least 15 gallons of jugged water in the house to guard against those times when the pipes freeze for a day or 2. At least I had a roof over my head, and enough wood to battle the cold. My ordeal made me even more thankful for what I do have, and on a quest to figure out what I can do to help those that don’t. I can’t even wrap my head around the idea of being homeless with children in the winter around here. The New Year has started well. A local farm, Rainshadow Organics, was also hit hard by the deep freeze, which hit their stored potatoes. Rather than seeing it as a complete loss, they invited the public to join them on January 1st to go through the potatoes, sorting out the rotten ones and taking home as many free potatoes as you could carry. These were several beautiful heirloom varieties, and I made the drive out and joined the crowd. 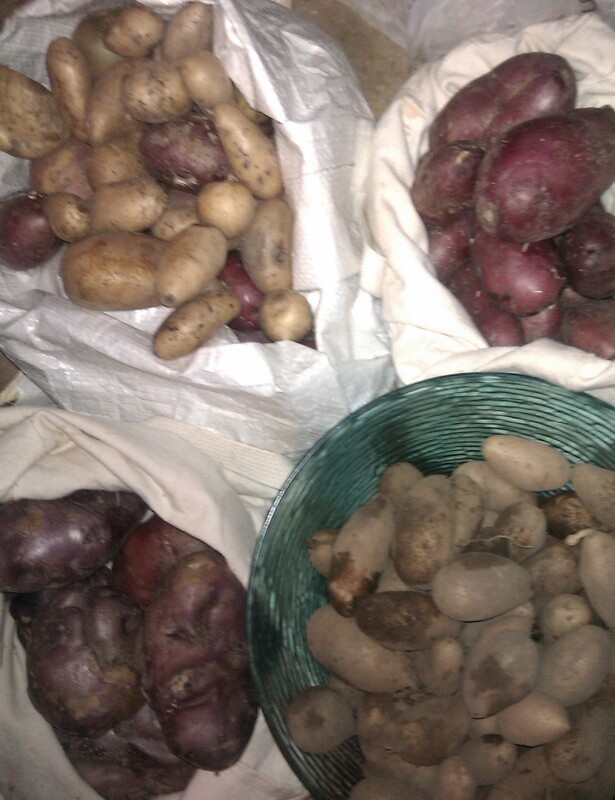 Folks were also invited to help sort out spuds that would be donated to local food banks. This is my loot, after I had given away several pounds to friends and family. I don’t know that any will survive to be planted in the spring, but I will be ordering some different varieties to grow. After I got more potatoes than I could really carry, I went off to gather up 9 gallons (yes, gallons) of raw cow’s milk that had not been picked up from the dairy. No sense in letting it go to waste, so I am playing at cheese again. I have already made mozzarella and ricotta, trying a little different method for each, and now I am ready to try my hand at cheddar and jack. It is nice to have such a quantity to work with, but a bit daunting too. I am being good about keeping notes on what works, which I think will be even more important with the hard cheeses since they have to age for so long before you can taste them. Yesterday I went to Laura’s. 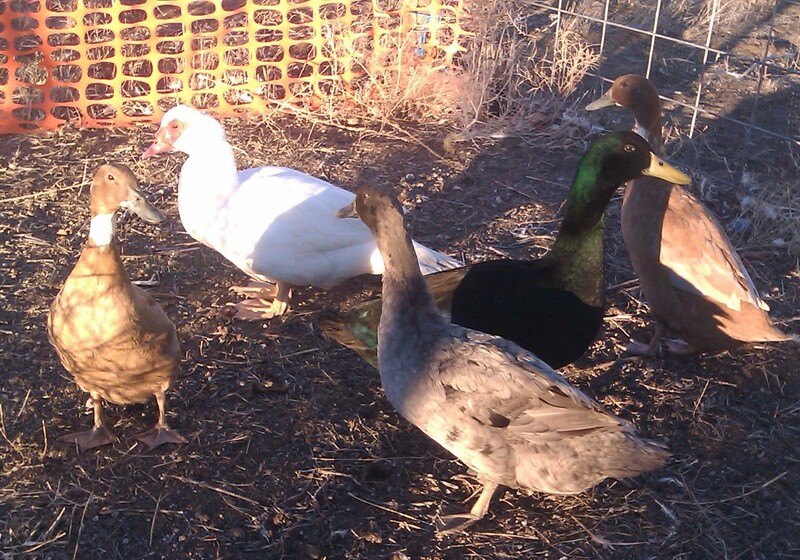 I took her potatoes and cheese and picked up the newest flock members (the “New Kids” referred to in the title) – ducks. A mutual friend was disbanding his farm, and she had collected 13 ducks from him. They are mostly Runner crosses, which makes them a little odd looking, but the females should be laying soon. After doing a bit of research online, I got one of her Muscovy males (the white duck below) to try my hand at breeding moulard ducks for the freezer. We thought we had sorted out 4 females for me to bring home, but in talking with their original owner last night it turns out that the big, beautiful black is also a male. I don’t want the girls to have the option of breeding with him, so I will be separating him out of the group in the next day or so. They are all a little skittish right now, what with 2 major moves in as many days, so I will give them a little time to settle down. I am very excited about having duck eggs to work with, especially for pasta making. Yum! I have also made a decision about recreating the shawl that was stolen last summer. I’ve been working on some commission spinning this fall, and talked the woman into letting me do a yarn with silk noil added in. It turned out very pretty so I made up some for me too. I am doing one ply of the black alpaca/black American top/dyed silk noil and one of the American top, both spun very thin. This is a very dense yarn, so I’m not getting the yardage that I’d hoped for, but I think it will be spectacular knit up. 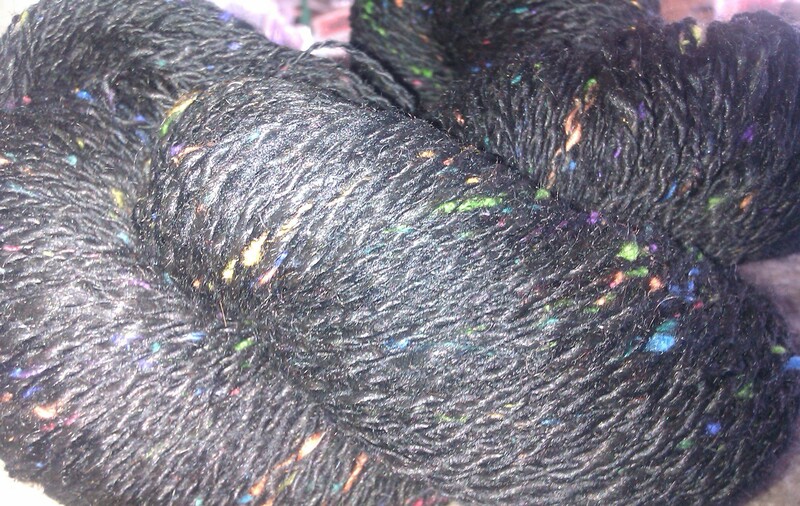 This was the last yarn I made in 2013, about 350 yards. Since I will need about 2000 yards, I have quite a bit of spinning left to do! I’d like to get it done in time for Fair, so I have my work cut out for me. I’m hoping I have enough of the black alpaca left (fingers crossed). Continue my weight loss/get healthier campaign. I am very happy that I have managed to maintain my weight through the holidays. Didn’t lose any more, but I didn’t put any back on either, so I count that as a win. Blog more often. I compose wonderful posts in my head as I’m doing other things, but then I get in front of the computer and do other things. I admire folks that blog every day or so, but that isn’t me. Once a month is too little though, so I will just say “more often”. Make more art. I have tons of art supplies that sit unused, and I need to stop that. It doesn’t have to be great art (and I’m pretty sure I can promise that it won’t be), but I need to get over the idea that it needs to be. I started this morning. Don’t count on seeing any of it shared here, unless I get really brave. Sew more. Again, I have tons of supplies that sit unused. Even if I just make a pile of quilts to donate to the homeless shelter, it would be good to clear out some of the stash.